A brilliant young pianist covers two of the piano repertoire's best-loved works . . . This scintillating recording was made live at St. Petersburg's 2012 "White Nights Festival". Here Wunder is accompanied by the magnificent St. Petersburg Philharmonic under the baton of the legendary Vladimir Ashkenazy . These are works that Ashkenazy knows well -- he has performed them himself as a pianist hundreds of times -- and he brings crisp, precise support to Wunder's reading. In Ashkenazy's own words, Wunder offers a performance that is 'convincing, fresh and interesting.' Certainly there are moments that are revelatory in these familiar works as Wunder gives every note appropriate weight and emphasis. Austrian-born Ingolf Wunder (1986) is among the latest group of amazing young virtuosos . . . these are brilliant performances, with Ashkenazy on the podium . . . and you'll hear some orchestral details usually unnoticed. Excellent audio . . . [Wunder]: doubtless we'll hear much more from him. Ashkenazy gets really silken sounds out of the St. Petersburg Philharmonic Orchestra, and where pure precision is called for, as in the high-note passages of the slow movement of the Tchaikovsky Piano Concerto No. 1 in B flat minor, Op. 23, the results are excellent . . . Wunder is a good, maybe great technician . . . Deutsche Grammophon's live recording at St. Petersburg's White Nights arts festival is exceptional . . .
. . . [Tchaikovsky 1]: The fireworks are impressive. Wunder has a huge and commanding tone, well recorded . . . He plays excitingly and with conviction. In the "big" moments, the pianist relishes the spotlight. Elsewhere, he plays like a young firebrand . . . A great performance . . . [Chopin 1]: [the orchestra plays] with attention to details -- and thus clarifying the much-maligned orchestral textures -- as a main attraction . . . [Wunder's] obvious gifts for Chopin are fully on display . . . this album displays genuine talent and artistry.
. . . two very good performances . . . [Ashkenazy] is at pains to let us hear Tchaikovsky's scoring in meticulous detail . . . Ashkenazy and Wunder make entirely empathetic partners . . . [Chopin]: [Wunder] plays this concerto superbly -- in particular the Romanze and the last movement -- and the recorded sound has a ringing clarity and depth. To describe Ingolf Wunder's performances as couched in a kind of neo-Mozartian aesthetic isn't to criticise but to applaud them . . . These are warm-blooded, big-boned, panoramic accounts, richly and subtly expressive without displaying a hint of bombast or manipulative self-indulgence. They are remarkably alike in their natural balance and their "symphonic" demonstration of unity achieved through diversity . . . Vladimir Ashkenazy is very much more than an accomplished and insightful accompanist. He is a fully fledged, generous partner, weaving the variegated orchestral strands into a polyphonic tapestry of timbres, perfectly suited to offset and enhance the very different sounds of the piano. Wunder, meanwhile, easily distracts us, when it's appropriate, from the essentially percussive nature of his instrument, not least when he uses his power, depth of sound and breadth of phrasing to meet the orchestra on its own terms -- as in the first movement of the Tchaikovsky. Indeed this is one of the most subtly and illuminatingly coloured accounts of this work I've encountered . . . these are both outstanding performances. The orchestra is superlative, the conductor an elder statesman, the young prize-winning pianist a model of cultivated style . . . The recorded sound is the single best thing, since it blends the orchestra and piano together so beautifully -- there's no highlighting of the soloist, making this the only recording of the Tchaikovsky First in my experience where the pianist's opening chords don't crash and bang. Second best is the gorgeous playing from the St. Petersburg Philharmonic . . . Ashkenazy's contribution from the podium is expert . . . This leaves only Wunder to consider, and I'd say he fits into the package perfectly. His touch is exquisite in its lightness. Passagework is amazingly even; he never indulges in a vulgar gesture . . . Wunder is a sterling soloist in both works.
. . . Wunder's unquestionable skills and professionalism would be easy to recommend without the slightest qualification, not to mention the St. Petersburg Philharmonic's contributions with Vladimir Ashkenazy at the podium . . . Wunder's fingerwork in the second movement's central Prestissimo is admirably supple and fleet . . . Listeners curious about today's rising keyboard stars and how they handle the concerto repertoire's greatest hits might wish to sample this disc . . .
Ingolf Wunder und Vladimir Ashkenazy ist eine fantastische Liveaufnahme gelungen . . . Selten hört man Tschaikowskys erstes Klavierkonzert so klar und rhythmisch differenziert. Und trotzdem gelingt es Wunder, schwärmerisch und wuchtig zu klingen, ganz so wie es dieses romantisch-expressive Konzert erfordert . . . Wunder scheint die Atmosphäre der Stadt, in der Tschaikowsky gelebt hat, regelrecht in sich aufgesogen zu haben. Begriffe wie "pathetisch" und "verzaubernd" bringt er hier musikalisch auf den Punkt. Leichtfüßig tänzelt er mit dem russischen Orchester durch den Finalsatz, überzeugt aber auch mit gekonnten Tempowechseln, als ob seine Hände sich gegenseitig ausbremsen würden . . . Auch im Chopin-Konzert überrascht Wunder mit eher sparsamem Pedalgebrauch und strahlender Klarheit und ist damit eine Ausnahme unter seinen Pianistenkollegen. Dadurch erreicht er eine Intensität, die durch ihre Schlichtheit tief berührt. Es ist schwer zu sagen, was mehr beeindruckt: die Klanggestaltung oder der Umgang mit Zeit, die fließenden Übergänge zwischen dem Rhythmisch-Exakten und dem Schwelgen. In jedem Fall ist Wunder und Ashkenazy eine der besten Liveaufnahmen dieser beiden Klavierkonzerte geglückt. Watch the album trailer for Ingolf Wunder's new album "TCHAIKOVSKY: Piano Concerto No.1 // CHOPIN: Piano Concerto No.1", to be released on Deutsche Grammophon. 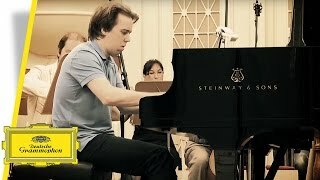 Ingolf Wunder presents two of the greatest hits in the repertoire: Chopin's and Tchaikovsky's First Piano Concertos - live from St. Petersburg's 2012 "White Nights" Festival. Returning to his beloved Chopin, Ingolf Wunder teams up with the supreme musicianship of the St. Petersburg Philharmonic Orchestra under the baton of legendary Vladimir Ashkenazy.